Minneapolis racing enthusiasts have probably heard of racing slicks. Now, slicks have no tread, but they give race cars maximum traction on dry MN racetracks. Insert a little water into the equation, however, and slicks can’t maintain control. Because there is nowhere for the water to go, the tire rides on top of a thin film of water and slides all over the place. Minneapolis / St. Paul street tires have treads that are designed to move water out from under the tire so that it can grip the road. The deeper the tread, the more water it can move. As tires wear they have progressively less traction on wet Minneapolis roads. That means longer stopping distances and less traction in corners. 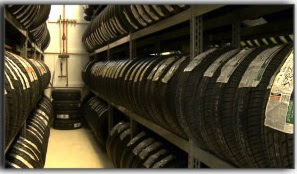 So having enough tire tread is important for the safety of Minneapolis auto owners. There have been tests comparing stopping distances of vehicles with new tires and those with worn tires. The vehicle with worn tires is still traveling at a high rate of speed at the point at which the vehicle with new tires has already stopped. That could be the difference between getting home safely and a serious accident on a surface street or freeway. Many MN safety experts recommend you replace your tires when your tread is worn down to a depth of 4/32ths of an inch. That’s the distance to George Washington’s head when a quarter is inserted upside down into the tread of a properly inflated tire. You may have heard of the same test using a penny. That gives you about 2/32ths of an inch of tread. The studies have shown a significant safety benefit in replacing tires with the quarter standard. Ask your cheerful Mr Tire Service technician to have your tires checked to see how much life you have left in them.